Chris Gayle is undoubtedly the King of T20 cricket. Since the inaugural edition of IPL, the West Indies hard-hitting batsman has set the stage on fire with his power hitting and has entertained the crowd. During the 2017 edition, Gayle became the first batsman to score 10,000 runs in T20 cricket. Overall in the IPL, he has hit 292 sixes from 111 innings with an amazing strike-rate of 150.71. He made his IPL debut for Kolkata Knight Riders in 2009 and played for the franchise till 2010. He hit 10 sixes in the 2009 edition. In 2010, Gayle showed first glimpses of his power and increased the sixes tally to 16. Playing for Royal Challengers Bangalore next year, Gayle hit 44 sixes with 2 centuries and 3 half-centuries. He further stepped up in 2012 and hit 59 sixes, with 1 century and 7 half-centuries. In 2013 edition, Gayle hit 51 sixes and the following year, he was able to hit only 12 sixes. He roared back again in 2015 with 38 sixes in the tournament, with 1 century and 2 half-centuries and followed with 21 sixes and with 2 fifties the next year. In last year’s edition, Gayle was bought by Kings XI Punjab. He hit 27 sixes for Kings XI Punjab and had a great opening partnership with KL Rahul in the initial stages of the tournament. He will be playing for Kings XI Punjab again in 2019. With age not on his side, this IPL might be his last and would be hoping to entertain the crowds. Gayle would be looking play with an attacking approach and help Kings XI Punjab win their maiden title. Gayle generally takes time to settle and then takes any bowling apart on its day. His ability to hit sixes at ease makes one of the best batsmen in the T20 format. Coming into IPL 12, he has been simply unstoppable. In the recently concluded ODI series against England, Gayle scored 424 runs from 4 innings with 2 centuries and 2 half-centuries. Kings XI Punjab will be hoping to witness Gayle's magic and for him to help the franchise go all the way. Having played for so many franchises around the world, he has the ability to damage any bowler's figures. It is going to interesting if Gayle can entertain the crowds for possibly one last time. 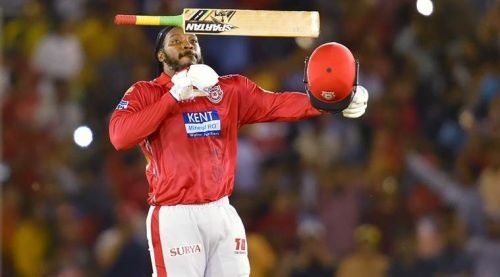 With World Cup 2019 being his last international tournament, Gayle would be hoping to smash the bowlers all over the park on good batting pitches in India.